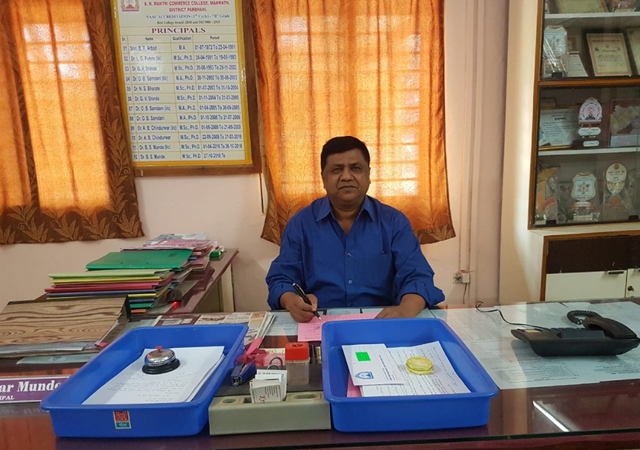 In the Marathwada, Parbhani District in particular, is one of the backward districts in economic, cultural and educational spheres of life since the pre independence area. Farming is the means of the livelihood in their children in cities due to their financial crisis.By taking into consideration all this matter, under the chairmanship of the late Hon. S.G. Nakhate ( Ex-State Minister for transport), the traders, farmers, and educationally cautious people came together to establish the Pathri Taluka Shikshan Prasarak Mandal in 1971, which runs the Katruwar Arts, Ratanlal Kabra Science & B.R. Mantri Commerce College since 1972. At the outset, I take this opportunity to welcome your energizing presence at sprawling and green campus of KKM, College ,Manwat on behalf of all the stake holders of this institution. With an objective to spread the light of education and knowledge among the different sections in the rural areas in the vicinity of Manwat, the college was established in the year 1972 with degree level education in Arts, Commerce and Science streams. Since that time, the college has been at the forefront to formulate an academic leadership. 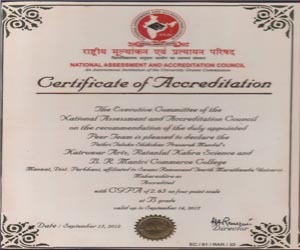 Even though it's a rural college, has already completed three rounds of NAAC Accreditation in the year 2004, 2012 and 2018 with 2.65 and 2.28 CGPA cummilating B Grade in these three cycles.We have ISO certification in the year 2017. 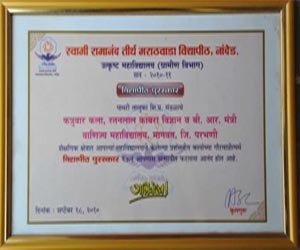 Apart from receiving Best Examination Centre Award twice ; the college was awarded with The Best College Award from the parent university in the year 2010. The College annual magazine 'Manwata' has set a record by winning state and university level prizes for many a time in the nearest past. The sport department of our college has been adding feathers to our glory in terms of organizing university and national level competitions, participation and medals in national and international level competitions and facilitating our students with an indoor stadium and running track to develop sport culture.The students and faculties have been involved in different research -oriented activities to enhance their research perceptions. We also believe in the matter of fact that a college should be well connected with the region it represents. Therefore, we have been striving to formulate a bond of concern with the nearby villages through different NSS activities. 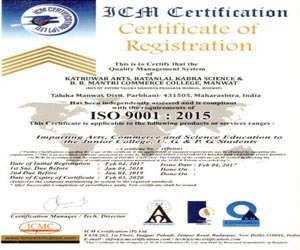 At present, we have 1100 student strength from three degree courses and one PG course i.e.M.Com. We have started one certificate course in Communication Skills from the present academic year to enhance language competence of our students. We are planning to initiate P.G. courses in the subjects such as Chemistry, History and Mathematics along with a few certificate courses from forth-coming academic year. Being a rural institute, there are multiple barriers but still we believe in the fact that quality enhancment has no such barriers at all..